Mathematical Reading – Wrapping my thoughts up. I have spent the last couple of posts discussing the value, need, and potential of considering mathematical reading an essential learning target in all math classes. And in my years in education, I’ve heard “it’s not my job to teach reading” from math teachers many times. And I forgive them for saying it. Math is a world that communicates differently. Graphs, charts, symbols, equations… we do that stuff so that we don’t have to read. “The sum of the squares of the legs of a right triangle is equal to the square of the hypotenuse”. There’s a reason people (both mathematicians and students, mind you) look to use notation to represent those two statements. it is quite a bit easier for a student to say “well, y = mx + b… slope is the m.” And what’s more, that statement will work effectively more often than not. So what’s the problem? Through the lens of solving math problems on a test, there probably isn’t much of a problem. But consider reading to be an essential problem-solving skill, then there’s a risk to consistently easing the reading burden. We might be navigating our students strategically away from something they’ll need. And while this thought process was instigated by the releases based around the redesigned SAT, I wouldn’t simply use the test as the primary motivator for updating our math classes. I would prefer to examine what message the College Board is trying to send by insisting that their materials insist on such a high degree of literacy for all subject areas, even considering that they have a reading and a writing test already. Now it’s on all of you to help answer my questions and there was a lot. Ready? Go! In 1974, the state that had the highest population density was New Jersey with a population density of 1305 people/sq. mi. In the years that followed the decline of the auto industry, the populations began to shift away from the major industrial centers (like many of the cities in New Jersey). By 2015, New Jersey’s population density had dropped to 1210 people/sq. mi. If New Jersey has a total size of 8700 square miles, how many fewer people live in New Jersey in 2015 than in 1974? The math of this problem isn’t really that sophisticated. Take your densities, multiply them both by the area to get total populations. Subtract the bigger population from the smaller population and there you go. Did computations correctly, but computed the wrong numbers. Didn’t know how to set up the computation because they got lost in the vocabulary or notation. Didn’t know how to set up the problem because the task was unclear. Got frustrated and skipped it because the US Census keeps records of state populations that can be referred to instead of having to crunch numbers. From an assessment standpoint, what does a correct answer from a student reveal to us about what that student understands and is able to do? We know that student can work with rates and units in context. We know that student can multiply and subtract strategically and accurately. We know that student has the ability to accurately comprehend a piece of reading equivalent to about a seventh or eighth grade level. I want to talk about that last one. The reading one. If that question appeared on a math test, what would be the value of exploring their ability to read? It seems like we have tests for that. Won’t they reveal those things? Shouldn’t the result a math test be based simply on a student’s ability to do math? The literacy component of the SAT Math test is quite heavy. The problem that I highlighted (which I made up… along with most the data in the problem) resembles the SAT Math questions pretty well. So, the College Board (authors of the SAT and most the AP Tests) seem to be making the statement that college readiness includes the ability to read. I’m not sure there would have been much argument for that in general, however, there are SAT portions for reading comp and an essay. The literacy bases seem covered. 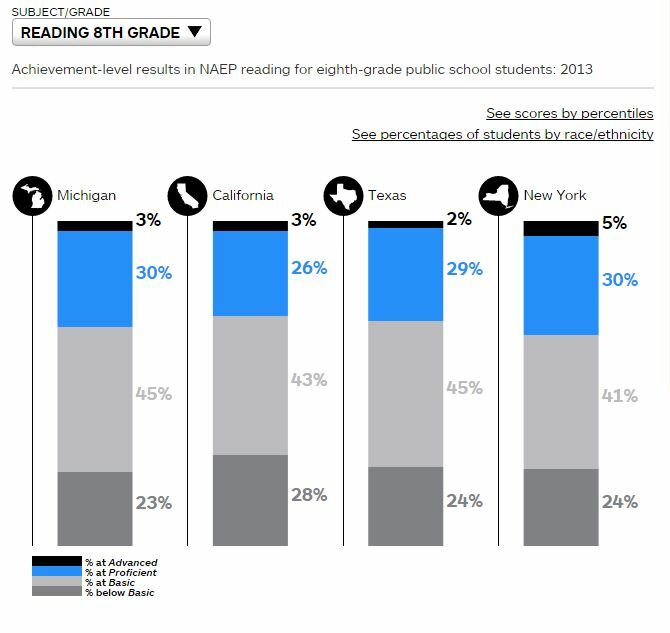 So, why put such a high emphasis on reading in math? 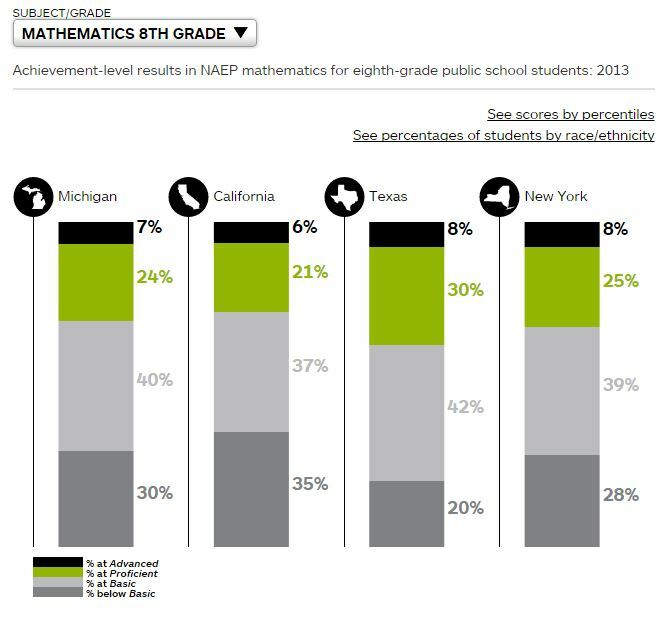 Perhaps The College Board is making the statement that math proficiency includes the ability to fluently read mathematical scenarios. I’m of two minds on this issue, so I’d really like some reader participation in the comments. I’m not at all attempting to challenge the value of reading, but some students really struggle with reading. Does a reading struggle apply a ceiling to future math growth? And if there is an essential connection between math and reading, what role do math teachers play in teaching reading? Should we be developing strategic interventions for math-based reading? I hope you’ll feel comfortable adding a comment, idea, or question that I’m not thinking about. In my next post, I’m going to further break down this idea with respect to my limited understanding of Universal Design for Learning.